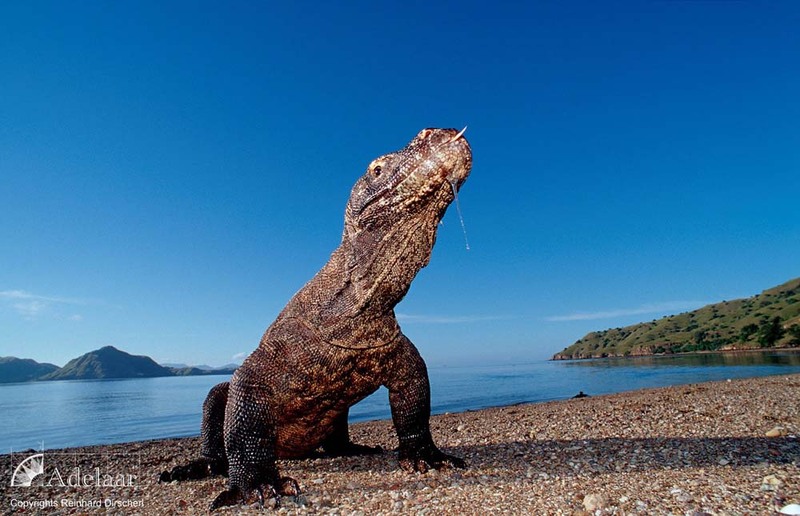 Adelaar is not only one of the best luxury Komodo diving liveaboards, the boat has plenty of history. 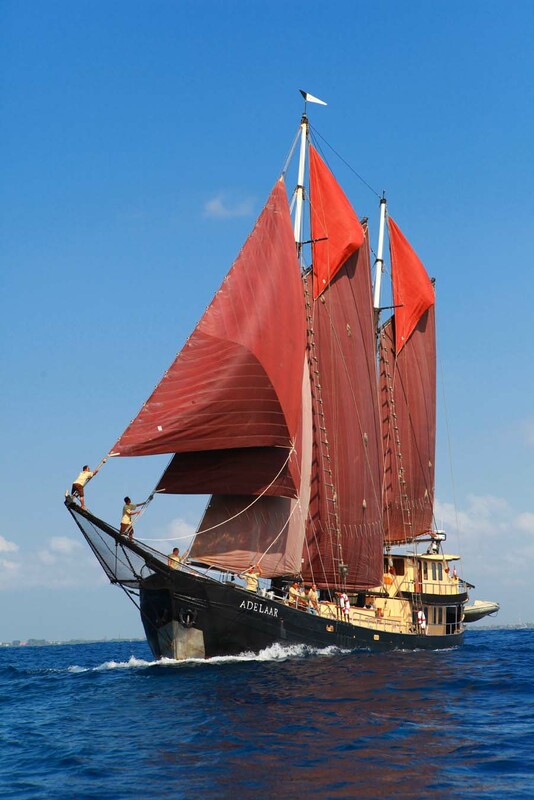 Unlike many other Indonesia liveaboard diving boats that are newly-built Phinisi schooners, Adelaar is more than 100 years old. 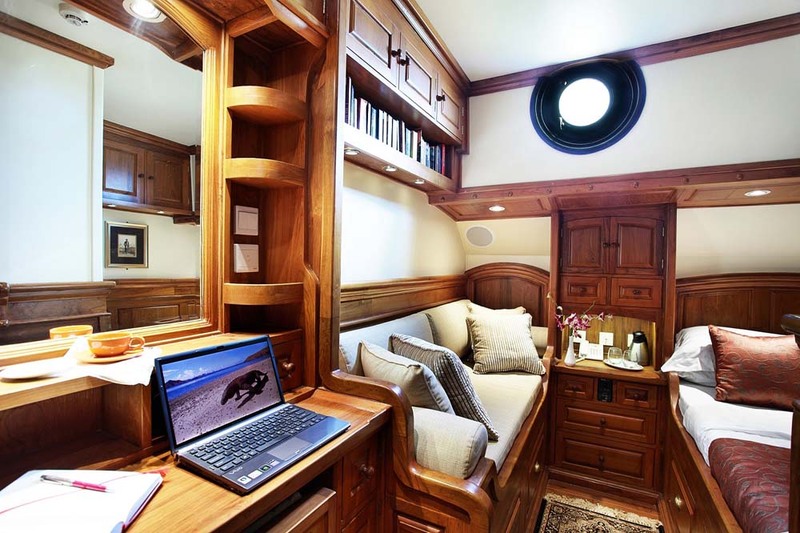 Of course, the boat has undergone a recent complete transformation to turn it into a full-service diving liveaboard, complete with Nitrox and all the latest navigation, safety and communication facilities. 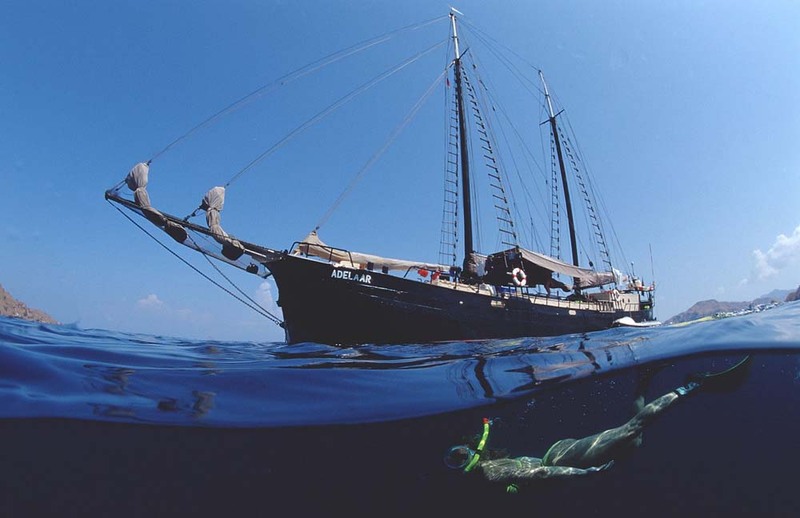 Although first built in The Netherlands in 1902, Adelaar is now a fully-functional scuba diving liveaboard in Indonesia. The boat has sailed the world, been confiscated and used by The Germans during World War II, won Tall Ship races, renamed and renovated. 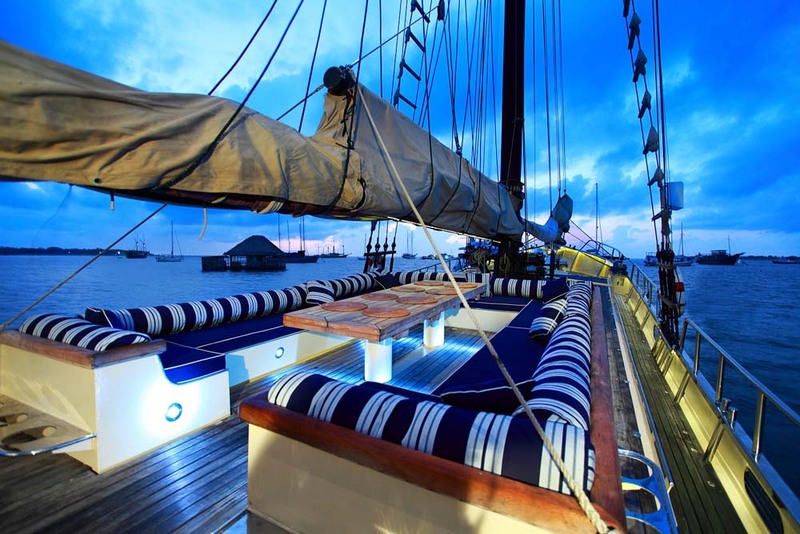 Since a recent complete renovation, Adelaar is possibly the most-luxurious Komodo liveaboard for no more than 8 very lucky guests (although up to 11 can join in special circumstances). 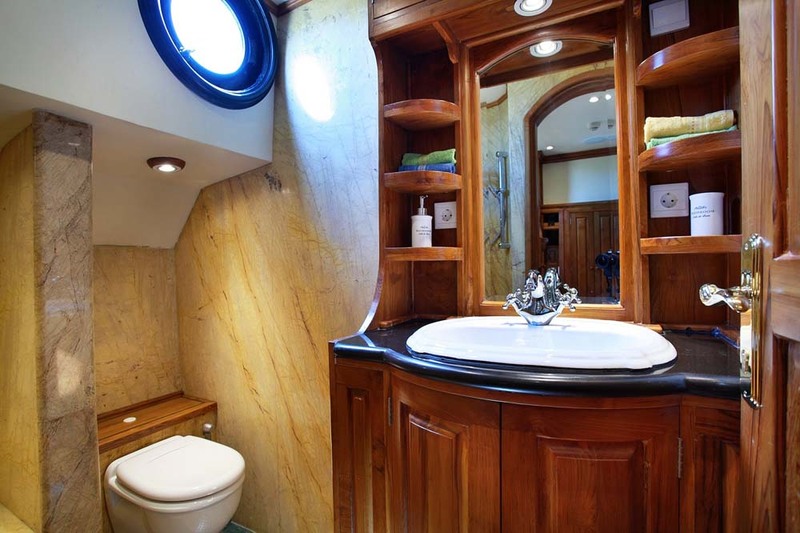 Each guest can choose between three cabins types, all of which are beautifully furnished, with marble en suite bathrooms, rugs, flat-screen televisions, and of course individually-controlled air conditioning. 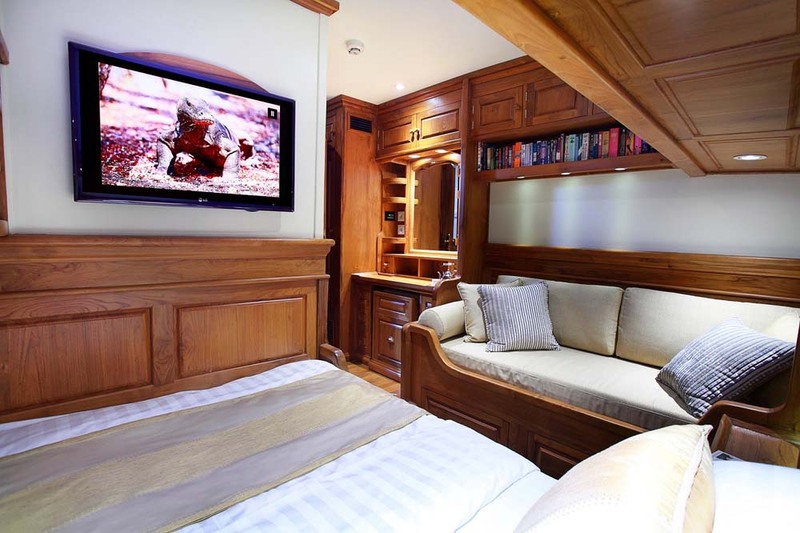 The Master Cabin has a large double bed, a sofa that can also be used as a bed, a huge flat-screen television, and plenty of shelves, cupboards & more. 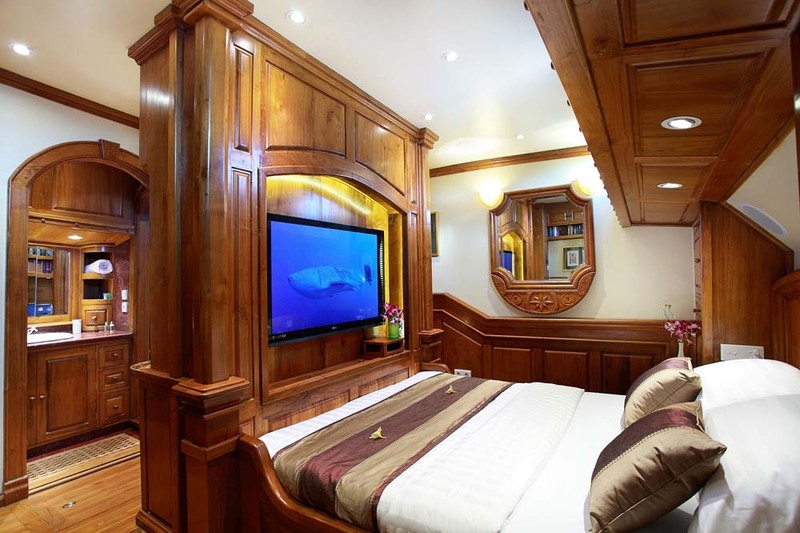 Staterooms 2 & 3 are also equipped with sofas, shelves, a work desk, decadent bathrooms and large tvs. 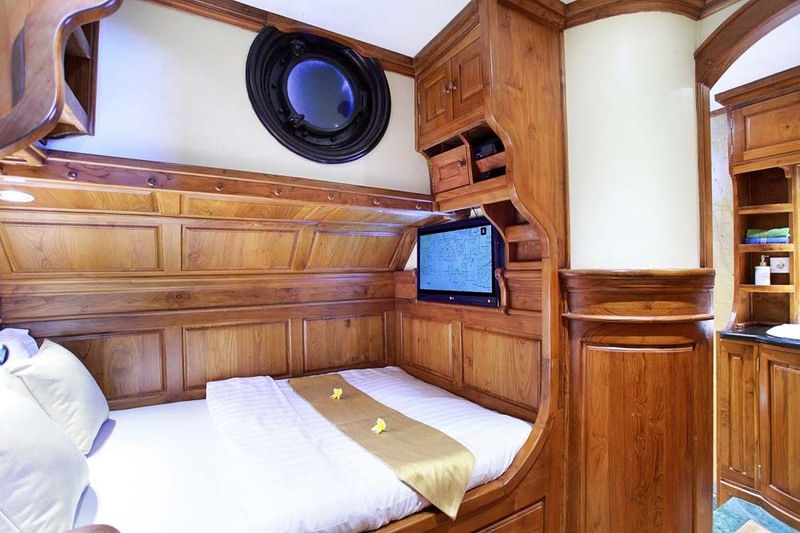 Stateroom 4 would be a master cabin on almost any other scuba diving liveaboard in Indonesia or elsewhere. 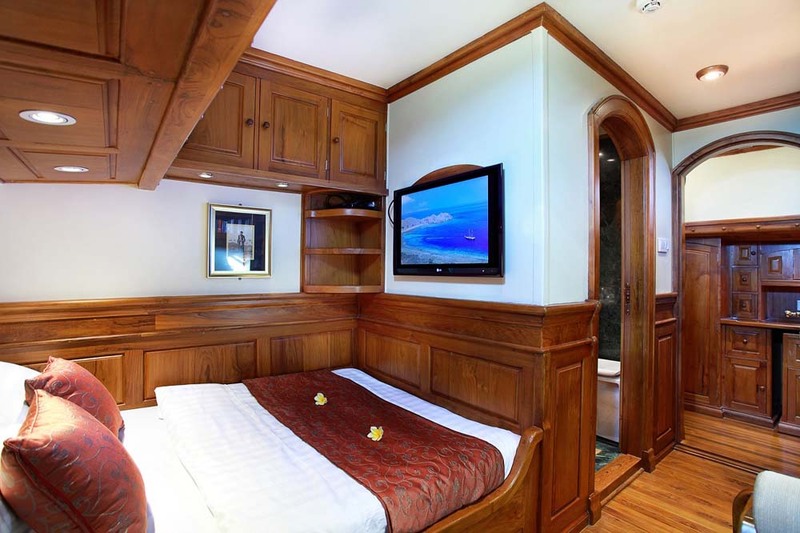 However, only when compared to Adelaar’s other cabins, do we need to mention that it is slightly smaller. 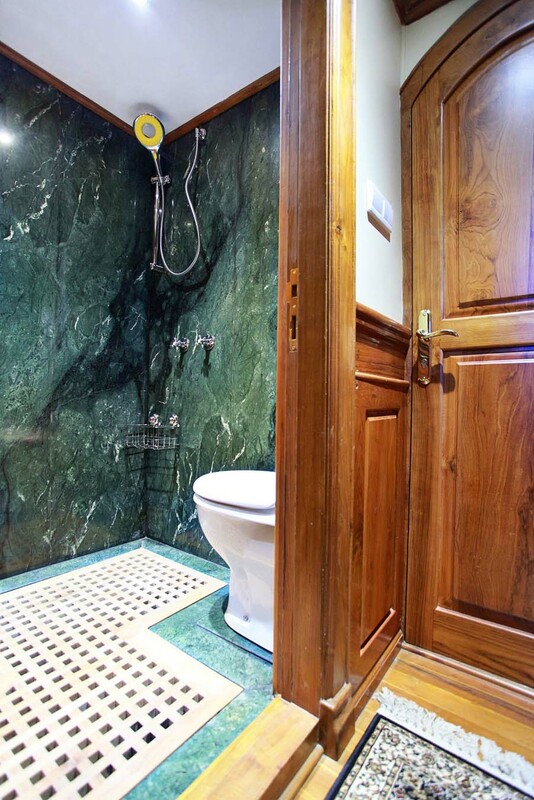 All of Adelaar’s cabins are delightfully appointed, and include touches which include room-service telephones, polished teak panelling, marble bathrooms and ornamental details all around. 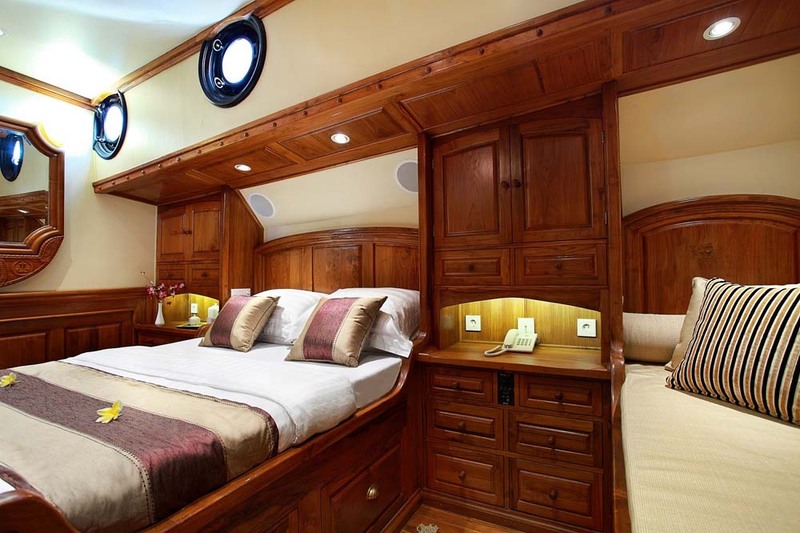 In addition to the wonderful cabins, Adelaar has communal areas that are equally inviting for the lucky guests on board. 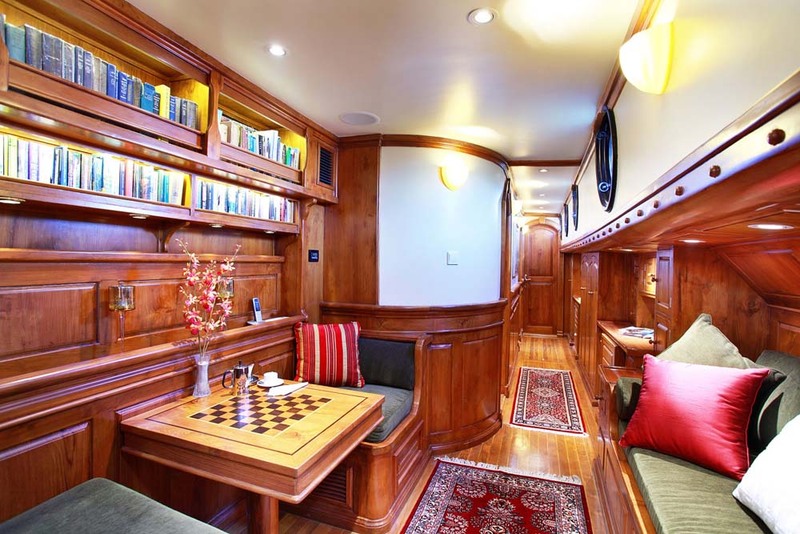 These include an air-conditioned saloon lounge area on the cabins’ deck, plus indoor and outdoor dining areas. 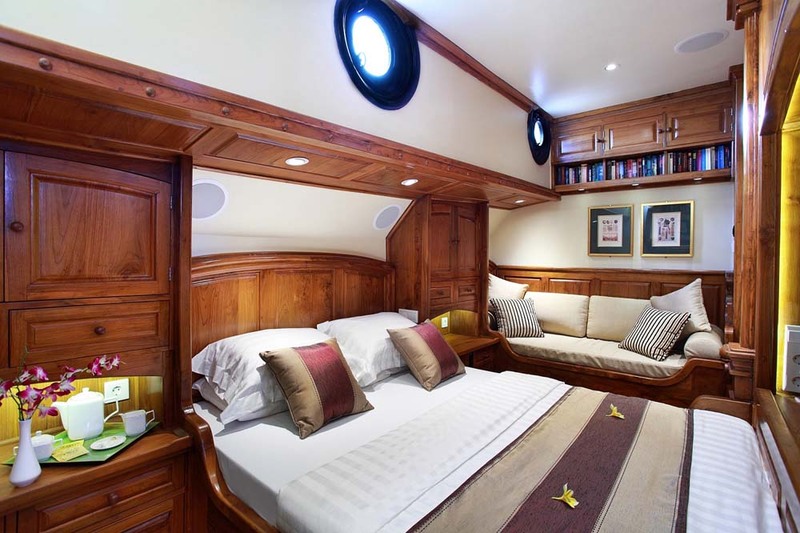 The staff and crew also have comfortable accommodation in other areas of the boat. 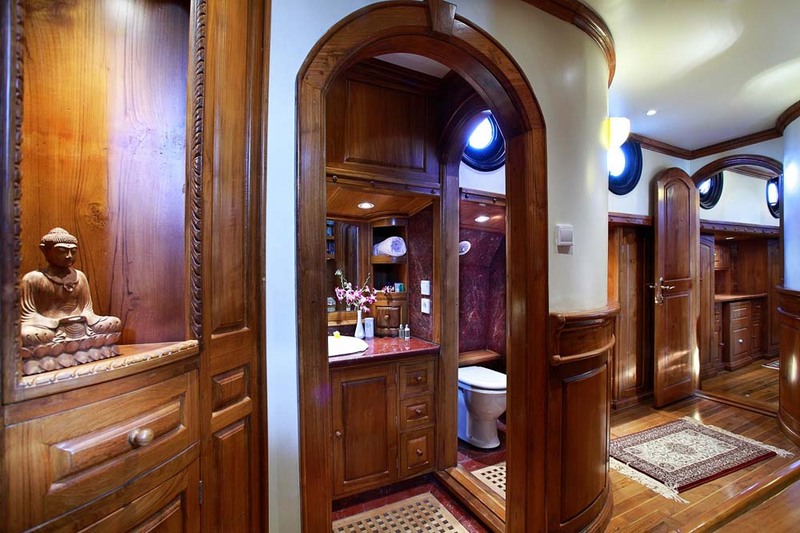 This enables them to always be able to offer the unbeatable service that Adelaar is famous for. 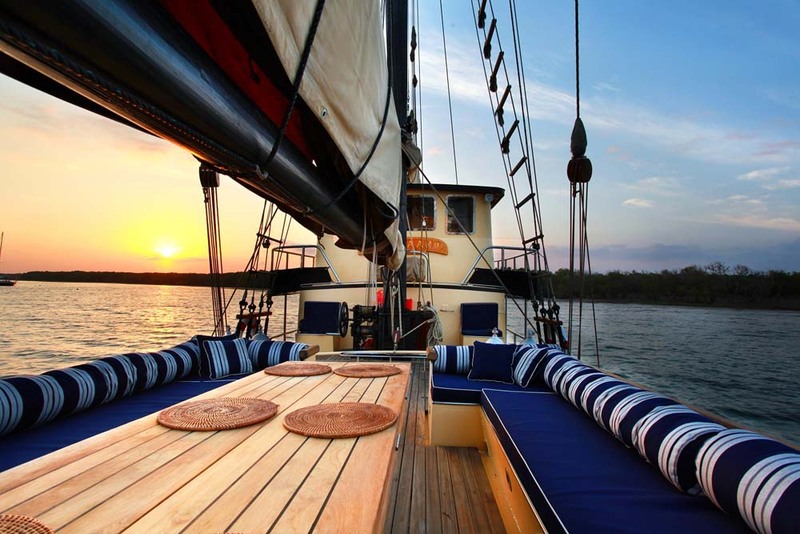 Services include exquisite local and western cuisine, dive advice including the locations, marine life and equipment, plus instinctively knowing what each guest’s needs are at any given moment. After diving around some of the best dive sites in the world, guests need something to look forward to after leaving the water, and Adelaar guests certainly have. 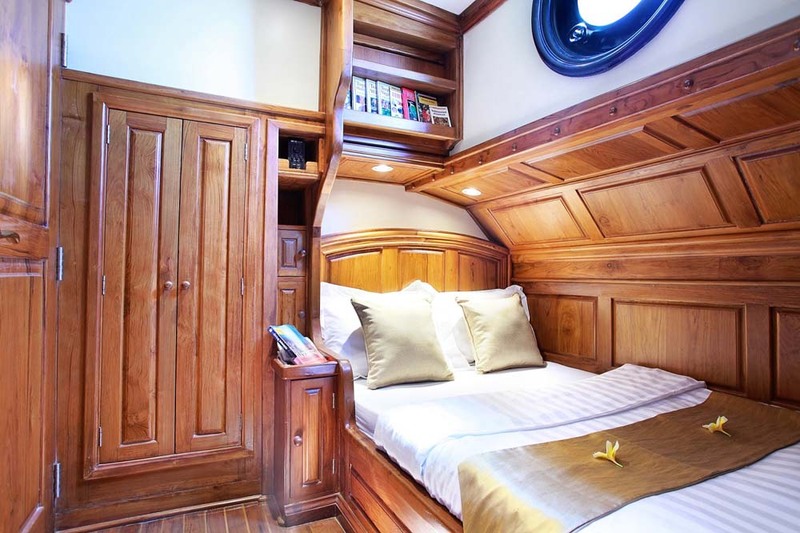 Also, Adelaar has a good selection of watersport 'toys' which can be used by guests, and some of these are particularly interesting to non-diving guests or those on a private charter. They include water skis, bodyboards, AirSofas, and plans for SUPs by the end of 2017. Kayaks may even become available, but please check before booking, if this is important to you. 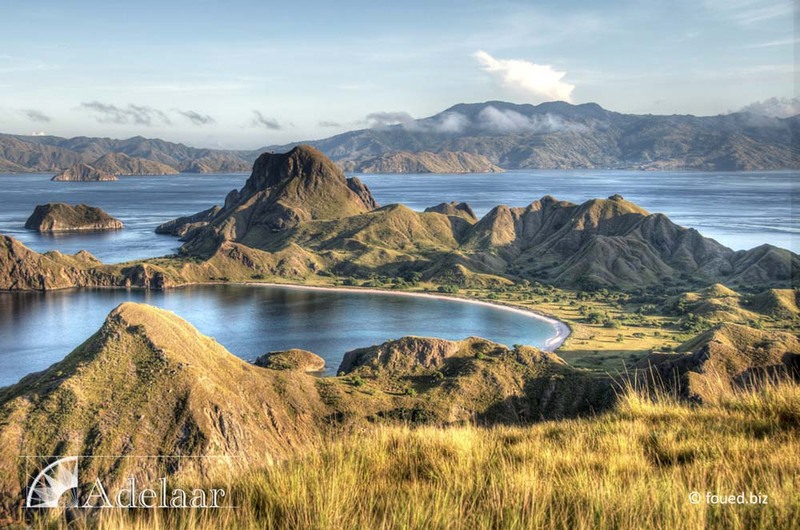 To add to the luxury and convenience of liveaboard diving at The Komodo Islands, instead of having to catch a domestic flight to Labuan Bajo, Adelaar guests sail directly from Bali. This may not sound such a big deal, but it’s worth bearing in mind that it’s almost impossible to book a domestic flight in Indonesia while overseas and using a credit card not issued in Indonesia. Add to this the limited baggage allowance which often results in scuba divers paying over the odds to travel with their equipment, and the unreliable domestic flights, and sailing directly from Bali makes so much more sense. 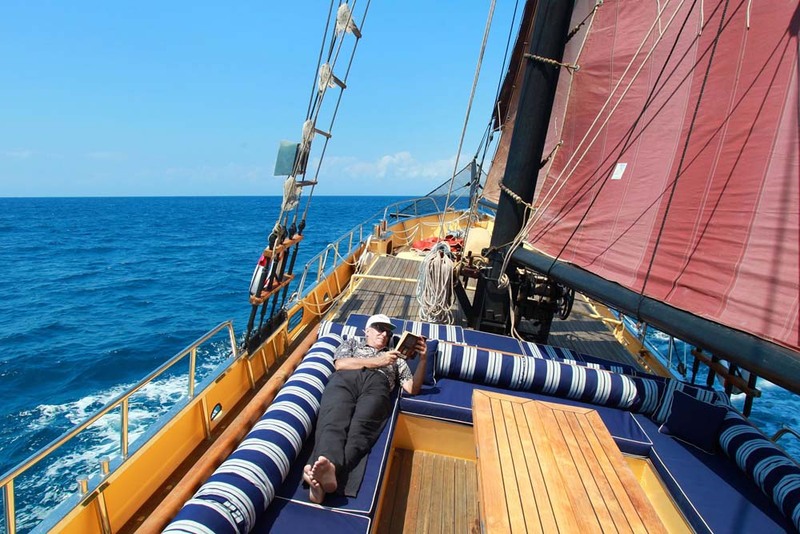 This way, guests can enjoy stress-free travel throughout their Indonesia liveaboard scuba diving vacation. 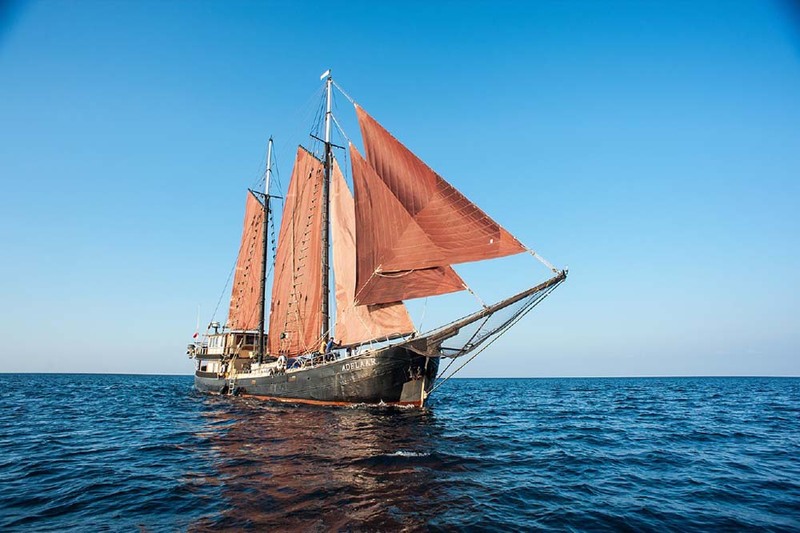 Type: Dutch Schooner / Royal Dutch Certification (Bureau Veritas). Compressors: 2x Bauer Dive Compressors. Instrumentation: Nautilus Lifeline GPS Tracker & Communication System For Divers, ICOM HF Transceiver (all Channel), ICOM VHF Radio. Dinghy: 2 Aluminum Dinghies With 40 HP Outboard Motors. Safety: Emergency Oxygen And First-aid Supplies.